Several weeks ago I was shocked to discover that the Peterborough Petes were going to give me one of their OHL Championship rings. 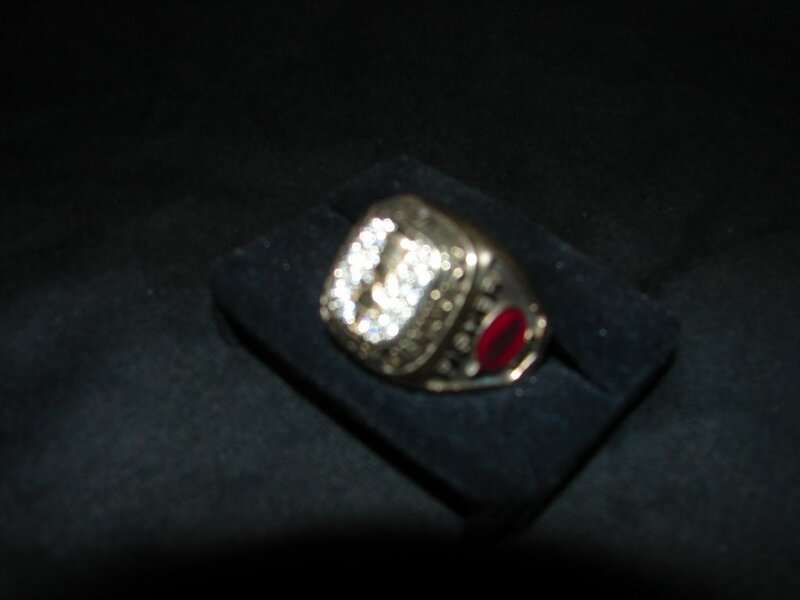 When GM Jeff Twohey asked for my ring size I was taken aback. This had never happened before. I was with the Toronto Blue Jays for their two World Series championships but never expected nor received anything like this. It was hard to get a close up of this ring. The glow from the jewels made it difficult. My name is incribed on one side. Thank you Father for life's little surprises. This one came when I needed a little "pick me up". What a wonderful gift and lovely reminder! I hope you are feeling better! Take good care! Wow! What a nice surprise for you...God has certainly rewarded you! Enjoy your gift...how nice of the Petes to remember you...they obviously know what an important part of the team you are!